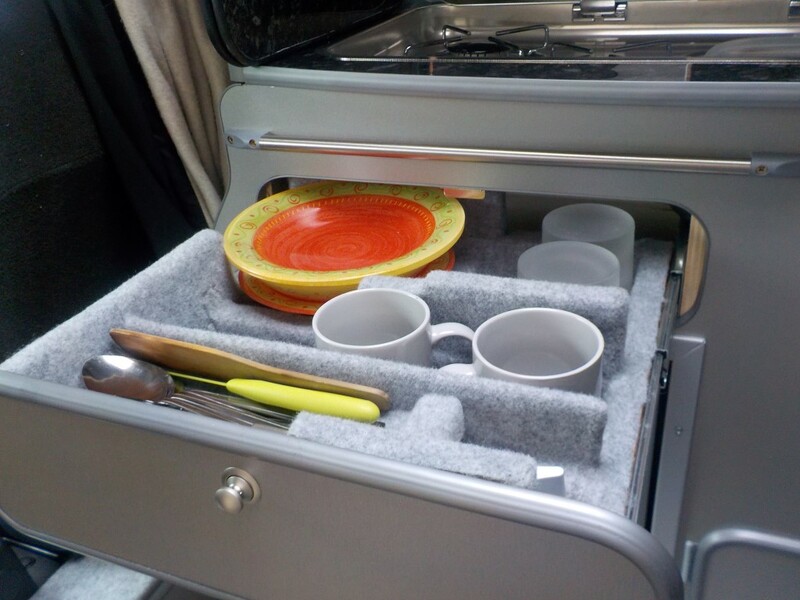 NV200: Kitchen drawer; plates, cups, cutlery storage – Do your dream! Storage is at a premium, so we’ve got to be clever. The drawer above the fridge is small, but we need to store a lot. So 2 breakfast bowls, one large salad bowl, 2 big plates, one small plate, 2 glasses, mugs, knives and forks, bottle opener, wine opener, spatula etc etc. Also the drawer will be used to store tea/coffee and washing up liquid – the jars are currently in the dishwasher and not shown. To save movement, the drawer is made strongly, with tight compartments for everything, with the cutlery being double-decker with the long/sharp knives out or accidental way. It is as usual covered in carpet. 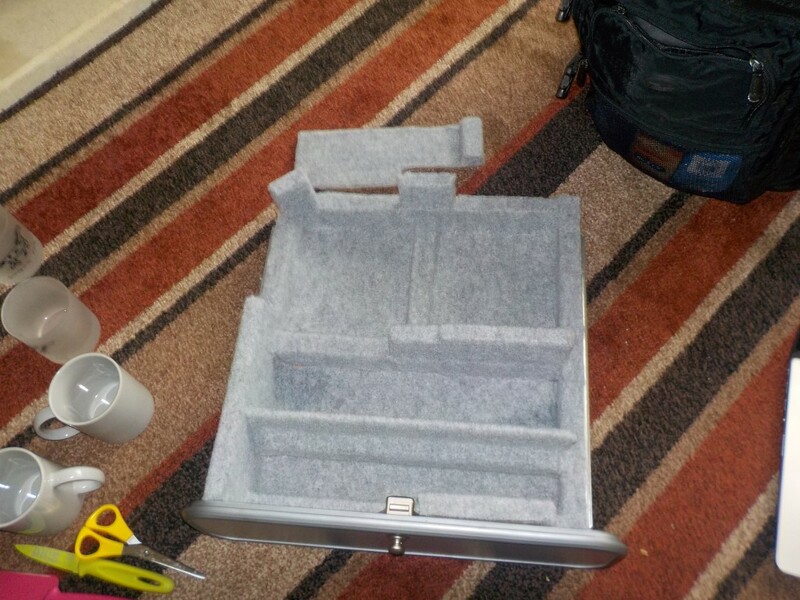 The drawer easily comes out if needed. 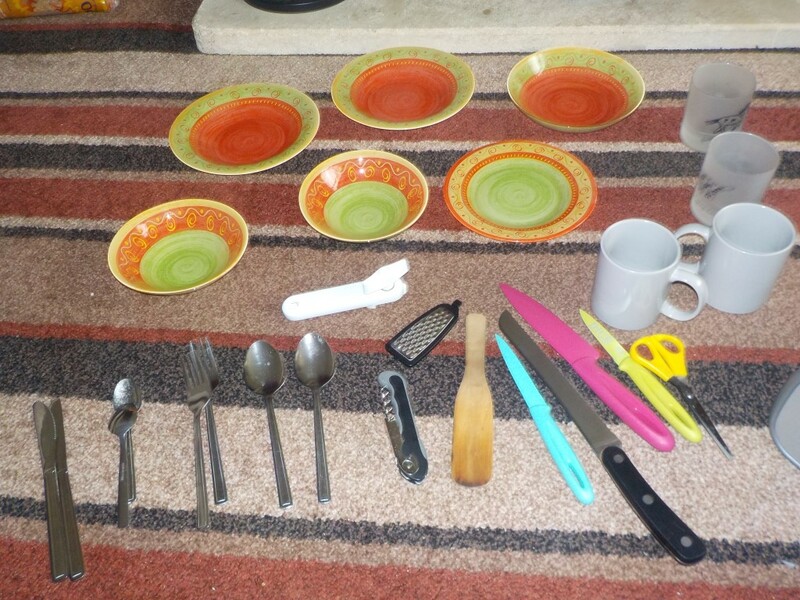 We also have 2 saucepans, 2 frying pans, sandwich toaster/grill thing, lids and kettle stored elsewhere. 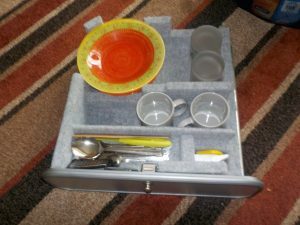 Also, now DVLA have approved, we’ve got rid of the table as we had no plans to use, and made 2 matching trays. These can be used as lap trays as needed, and as we’re short on worktop, one fits perfectly on the drawer to give extra worktop (hence the funny upstand shapes of the drawer. Quite a bit of planning on this drawer, and to be fair from the first ideas before we bought the van, as making this drawer usable set the kitchen size quite early on. 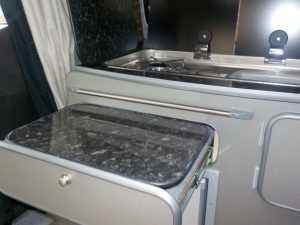 Also, as its accessible with bed down, the tray can be used as laptop stand when watching movies, and also things like cups & hot chocolate accessible without being trapped.